An individual project completed under the 'Art in Transit' pilot project run by Srishti Institute of Design at Peenya Metro Station, Bangalore. The pilot had students developing contextual art and design interventions for the station. My project aimed at illuminating the strangely pure, almost dystopian quality of Peenya’s industrial area by contrasting it against the kind of imagery one often associates with notions of ‘development’. In the form of a 2D layered miniature diorama, it weaves a whimsical dystopian narrative around Peenya and its role in building the city we live in. 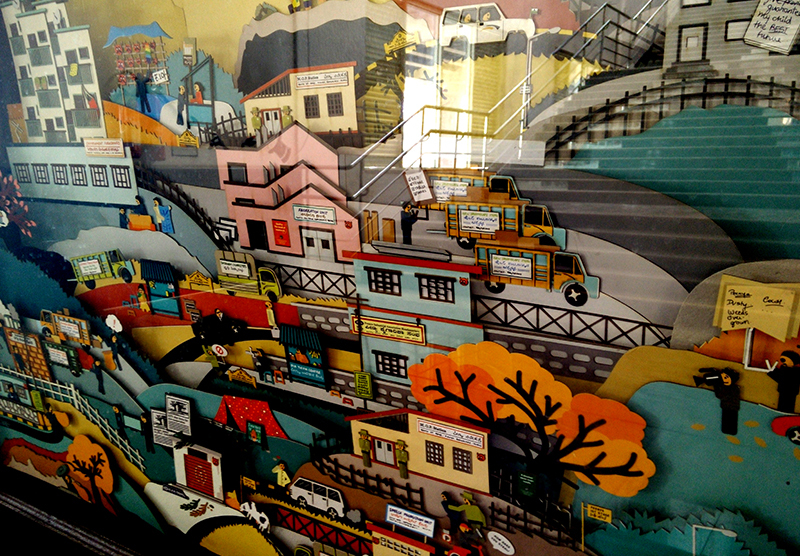 The scenes in the diorama draw from and exaggerate Peenya’s existing landscape while contrasting it against scenes that draw from the imagery in commercial advertisements. It hopes to question what development means to us and attempts to present the imagery we attach to it in a way that makes it seem alien.